Pont Du Gard Tomato Salad - Cooking With C.C. We had the opportunity to travel on a family vacation to France back in 2009. I had met a lady through IACP who led tours in Provence and Languedoc. We arranged to travel with her for three days while we stayed in the little town of Arles. We stayed in a small bed and breakfast run by a local chef. Our guide had arranged for the chef to pack a picnic lunch for our first day of touring. The highlight of our first day was a visit to the Pont Du Gard, a famous Roman aqueduct that was built sometime in the first century AD. 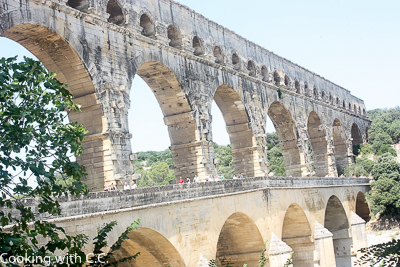 (To get a sense of the size of the Pont Du Gard, notice the people on the bridge in the picture.) We pulled out the picnic lunch to enjoy on the banks of the Gardon River and I had a discovery of simple yet fantastic fare. Our guide was living at a local winery, so she had also pulled a bottle of a local rose – so recently bottled, the labels had not yet been affixed. Along with the wine, we had a simple salad of fresh tomatoes in a honey mustard dressing. I could not get the recipe, so I’ve attempted to recreate the dressing. As the summer and tomato season is closing, I thought I would share this simple dressing that needs only a few ingredients, but requires fresh tomatoes. In a medium sized bowl, whisk together the Dijon mustard, honey, olive oil, 1/4 teaspoon salt, pepper, mustard powder and onion powder. Whisk until well blended and set aside. Note, the dressing will taste a bit strong since it will be diluted by the juices of the fresh tomatoes. To prepare the tomatoes, cut them in half crosswise. Using a small spoon, scoop out as much of the seeds and jelly surrounding the seeds as possible. Cut into 1/2 to 3/4 inch chunks. Place the chunks into a second medium bowl and sprinkle the remaining salt and the chopped thyme and toss together. Add the tomatoes to the bowl with the dressing and toss to coat the tomatoes. Serve and enjoy!